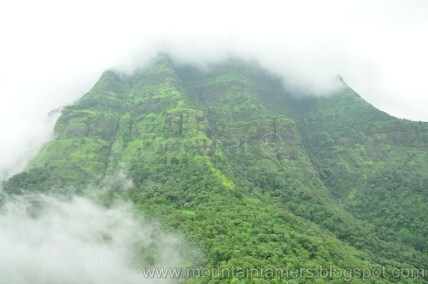 Gorakhgad can be an excellent pick, if you are planning a days' outing in Sahyadri Mountain Range. 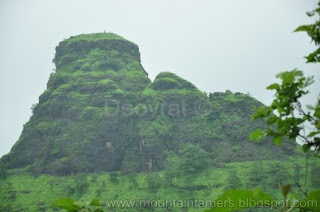 Situated in Dehri Village near Murbad (Maharashtra), amidst the thick biome blanket, Gorakhgad is a small hill projected out from the main Sahyadri. 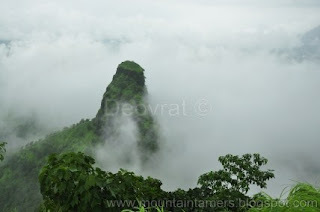 Extending to a lofty height of 2175 ft., offers a genial one day adventure trek for Monsoon-trekking lovers. My father had pre-planned this trek for a fine holiday, and that day turned up on 19th August, Sunday. Me, my parents,and my sister started the journey early morning at 6am from Dadar station to Kalyan station. Not far from kalyan station is the ST (State transport) bus-stand, where we caught a bus to Murbad. At Murbad we had light breakfast with the warmth of masala tea; since the next bus to Dehri village was half hour later. The trek initiates at Dehari village, which is also the base village of Gorakhgad Fort.The mountain trail starts behind a temple and enters into a thicket. Most striking feature is the entrance of the fort; small hole is punched through a mountain, and steps are carved inside it, leading to formation of underground tunnel. Then a steep ascend for about 15min. takes us to the base of the pinnacle. The challenge lies ahead!! To reach the top, one needs to call for rock-climbing. The climb is a steep ~65 degree; even though its not too dangerous, a wrong move can cost you your life.. Knee length rock-steps assists till the top of the summit. The stairway may sometimes become crowded; in that case a small rectangular cave, present mid-way, comes to the rescue. It can accommodate not more than 5 people, but it serves the purpose well. 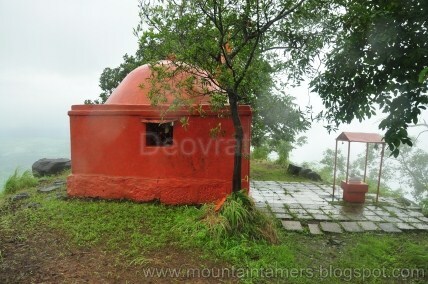 And atop nests a weeny Shiva Temple and also panoramic view of Sahyadri. 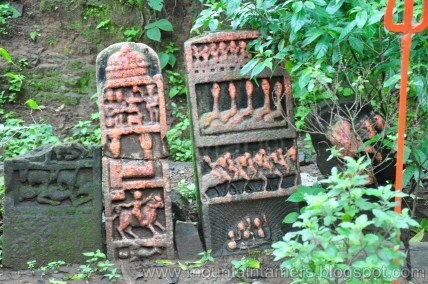 The pinnacle's of Machhindragad and Gorakhgad showcases that style of architecture that is unique to Sahyadri. With a huge cave, that can accommodate 30 people at a time, at the base of the pinnacle, there is plenty of potable water at the top; much to Chanderi fort. A small temple, about 500 meter descend from main plateau, showcases these medieval piece of work. This temple is obscured by thick treeline at the beginning of the forest, which confluences with the main Sahyadri ridge. 2/3 odd locals are appointed here to keep the scrutiny of this medieval treasure. Being the core monsoon season, this trek had offered something more than just an enthralling scenery; that was peace of mind, the feeling that overrides all pain, stress from busy chores. Substantial moments of life can be experienced if you consider ourselves as manifestation of Mother nature (its my reasonable hypothesis, though).